The Texas State Aquarium is a Sandpiper W.A.Y. Program Co-Partner and offers Sandpiper Guests a discount on admissions pricing. You make pick up your W.A.Y. card at the Front Desk. Come. Sea. 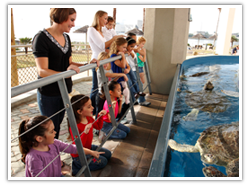 Discover the amazing underwater world of the Texas State Aquarium Corpus Christi. 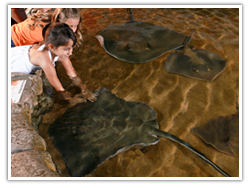 Travel an aquatic journey from the shore to the depths of the Gulf of Mexico and have the opportunity to experience dive shows, animal feedings, training sessions, and “hands on” programs with sharks and stingrays. Thousands of animals representing over 250 species, displayed in entertaining and educational exhibits, are ready to enchant, entertain and inspire you. A dolphin encounter, where you can hug and kiss a dolphin and even get in the water with a dolphin. Be a dolphin trainer for a day. A behind the scenes tour of the Texas State Aquarium. Every visit to the Texas State Aquarium is a new and exciting discovery of animals that remind us all of our responsibility to those whose world we share. Get up close and personal with Atlantic bottlenose dolphins from above and below the water in Dolphin Bay. Look to the skies as hawks, owls and falcons soar throughout the Hawn Wild Flight Theater. Visit the Islands of Steel exhibit, modeled after an offshore oil platform, where sharks and sea turtles live among schools of snapper, tarpon, redfish, jacks and grouper. Dare to enter the mysterious world of the Amazon rainforest and experience the exotic, the deadly and the fierce as you encounter poison-dart frogs, freshwater stingrays, and boa constrictors, and spend time in the Living Shores, where you can really get your hands wet! Watch as sea turtles gracefully glide in the waters of Tortuga Cay and see North American river otters play the day away in Otter Creek.